This year in Fuorisalone, Milan Design Week. 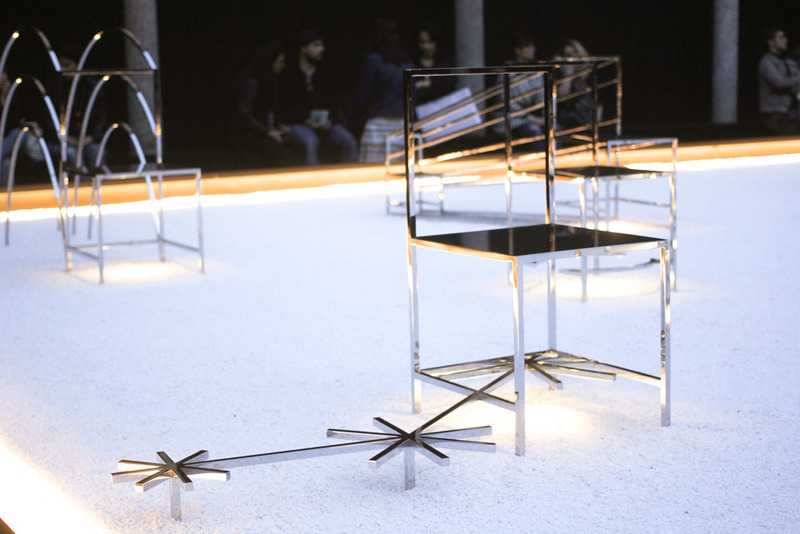 Japanese design studio Nendo exhibits its 50 manga chairs collection at Via dei Chiostri 6, Brera design district. Manga comics are deeply rooted in Japanese culture. The expression that fulls of flatness and abstraction, composed by series of lines. The installation lined 50 standard chairs up on the grid. Each object expresses the perceptions of manga by referring its physical movements or stories. Some chairs express sound or action while the others refer to emotional symbols from manga to illustrate characters and storylines. Nendo, 50 manga chairs. Fuorisalone2016. The designer team aims to maintain the abstraction of manga by avoiding of using color and texture in object design. Left only the well-polished surface that reflects the surroundings, same as what manga does – reflecting the real world. The installation space invited us to "read" the whole collection on the stage. By the end of the visit, we can find the projection mapping video that tells the stories of each manga chair. This is the point where we can fulfill our imagination, whether you are manga-lover or not. See the video by clicking link below.